Since some time, we are requesting our customers to give feedback on the deliveries via Kiyoh. In a short timeframe, we already received over 150 reviews. We are very happy with the results. Not only with the almost 9 on average, but also there are interesting suggestions. One of the suggestions is to setup a program for customers to receive an extra bonus when buying in our shop. As this was already on our wishlist, we decided to implement it and have worked very hard to get it up and running. From November 1st onwards, this is started, so everyone who placed an order since then, already collected points or Dox. Here you find more information on the program. You can see your earned Dox (when collected more then 0) when you are logged in. It will become visible in the frame on the left of 'my account'. As of mid this year, our company is running on green power. Real power from our own roof. We hope for a lot of sunny days! Last month we made a next step in preserving our environment: all our orders are shipped CO2 neutral. This means that the CO2 emmision as a result of the shipments is compensated in co-operation with PostNL and the Dutch 'Natuurmonumenten' by adding additional forest. This newsletter, we have a lot of new things to announce. 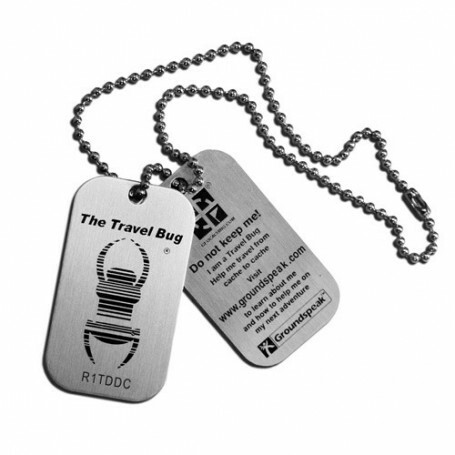 Not only a couple of beautiful new geocoins, but also we have now several Travelbug stamps. We also have some new containersets, including large containers (till 6.4 l). This cute geocoin is based on the english wordgame "The Minister's Cat". Buying the "Moon Caching Adventure" Geocoin you will become owner of property on the Moon. Your small ground (app 1m x 1m) of lunar land is located at the "Montes Alpes". This is a very nice region on the moon (great to hide Geocaches). There were several expeditions with the moon buggy into this region yet. This coin has been developed for the SAKE event in Krommenie. Both LE editions are only made with 40 pieces eache , of which we have a few left. Very detailed geocoin: on the front a female-geocacher on her way to the cache. On the back a unicorn. New in our portfoliio are the Travelbug stamps. Two models are delivered from stock (38 x 14mm en 45 x 16mm). Next to that, we have also models where you can add some text like your teamname. The delivery time is a few days (max a week). New: a container set with a round, 500 ml Curtec container. Robust and waterproof, with a two-component cover with sealring (for the FTF experience). New in our shop, a cute set for a birthday party. Including a robust 3,6 liter Curtec container. Standard for 6 children, but can be extended with a Signal plush and goodies for more children. Are you looking for a big, waterproof robust container? We now have a new startset with a 6,4 liter container from Curtec. Together with the goodie package a great offer. You can find these and other special coins on our website in Specialty geocoins. For the cold days in the coming time, the trendy, warm cottonwool with fleece hat is now available again. There was a production problem with the Montana bike mount, so we did not have this one for some time. Now it is back on stock again. We also have now the car suction cup mount for the montana, so you can use the montana also in your car. The Dutch Geocoin and Gemeenterace 2013 are both in production. We expect the coins by the end of november. Reservation is still possible. You will receive a notification when they are there. For the Dutch Geocoin there is a Limited Edition (antique silver) and a Regular Edition (antique bronze). Also the Gemeenterace 2013 geocoin can be reserved, but some editions might no longer be available. These coins are coming with the same shipment as the Dutch Geocoin, so they can be ordered at the same time (and saving shipping costs).